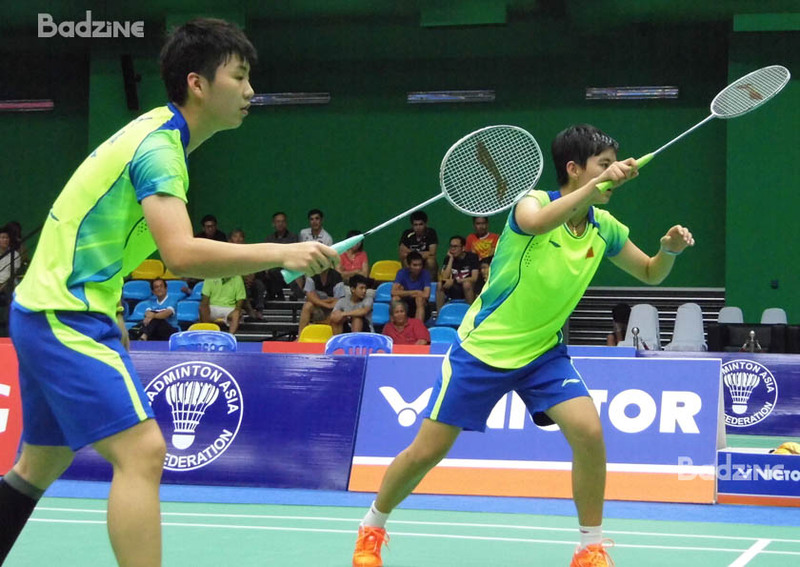 ﻿ ASIAN JUNIORS 2015 Finals – China sweeps titles for the 2nd time! ASIAN JUNIORS 2015 Finals – China sweeps titles for the 2nd time! 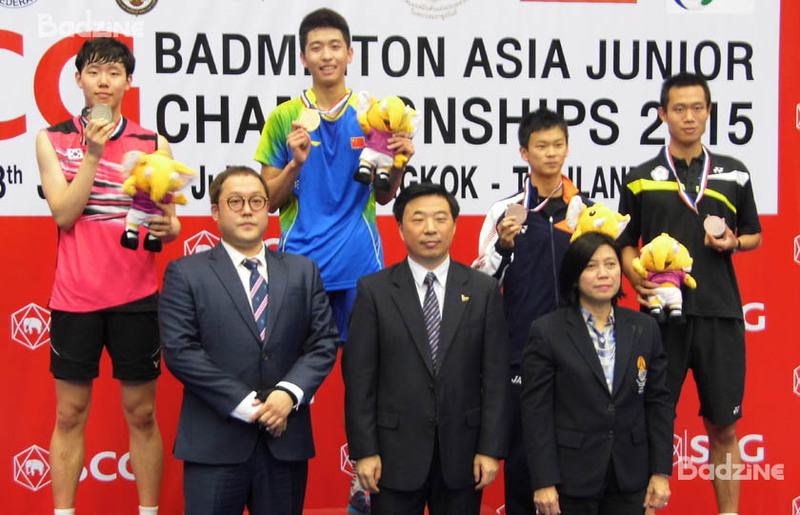 Team China swept the titles at the SCG Badminton Asia Junior Championships in Bangkok Sunday, as Korean and Thai opponents were dispatched in the first three matches to guarantee the sweep. Story and photos by Gerald Jew, Badzine Correspondent live in Bangkok. 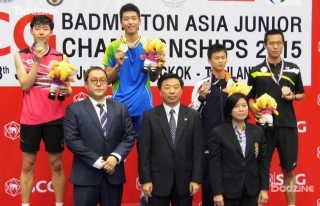 Sweeping the titles at the Badminton Asian Junior Championships is something no one has done since Lin Dan, Zheng Bo, Zhang Yawen and company did it 15 years ago. In the 2000 edition in Kyoto, China had to take two team titles. This is the first time anyone has done it since the move to a mixed team event in 2006 and interestingly, China again relied on a singles player named Lin, and twice on a doubles player named Zheng. The last time top-seeded He Bingjiao played in Bangkok, she was the bronze medallist at the World Junior Championships in 2013. This time, she got the ball rolling, and took the gold medal by defeating hometown hopeful Pornpawee Chochuwong (pictured) in the first match of the day. Chochuwong, the 8th seed, led early in both games of the two-game match before disappointing the hometown fans, who were hoping to see Thailand’s first gold medal ever at the Asian Juniors. In the mixed doubles, Chen Qingchen and Zheng Siwei (pictured above) easily defeated the Korean pair of Choi Jong Woo and Kim Hye Jeong in just 26 minutes, 21-8 and 21-12. Both Chen and Zheng were playing their first match of the day, and both had matches in the girls’ doubles and boys’ doubles respectively, later in the afternoon. Clinching the China sweep in the third match of the day was defending World Junior Champion Lin Guipu. The 6th-seeded Lin, displayed good defense and a dependable smash that saw him beat Korea’s 4th seeded Seo Seung Jae (pictured) in a relatively easy 40-minute affair. 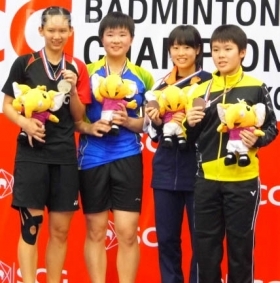 In the girls’ doubles, Chen Qingchen was looking to win her second gold medal of the afternoon – something she has become used to after doing it in both the Asian and World Juniors last year – but along with partner Jia Yifan, they were defeated in a 3-game match by compatriots Du Yue and Li Yinhui (pictured bottom). Chen’s mixed doubles partner, Zheng Siwei was able to accomplish his goal of winning a second goal medal of the day. Zheng and He Jiting (pictured), the second-seeded boys’ pair, beat unseeded teammates Han Chengkai and Zhou Haodong in a close three-game final match of the day, 21-19, 18-21 and 21-18.